As CGIAR holds the Big Data in Agriculture Convention in Kenya this week, the question of data, big data and open data in agriculture is yet again rejuvenated. The link between farming and data has never been stronger than now. There are many efforts driving the data agenda in agriculture, which include FAO, GODAN, CGIAR, USAID programs, and many others. 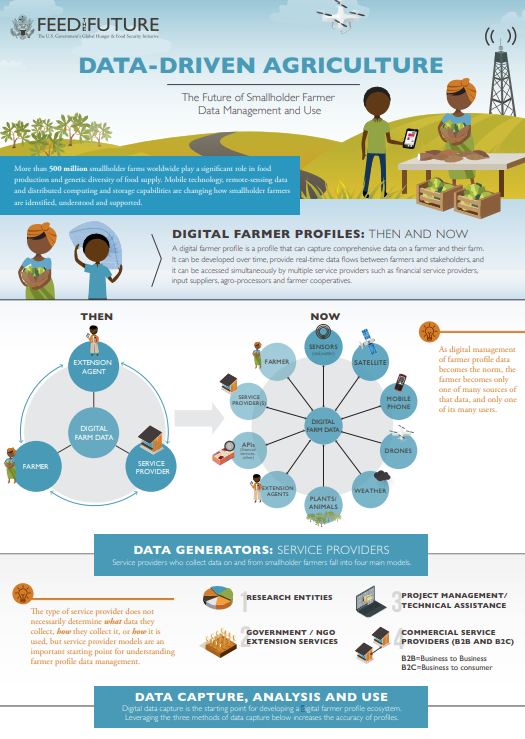 The modern farmer (called digital farmer) is depicted with a number of data sources – such as the mobile phone, drones, satellite data, field sensors, APIs for service providers, extension agents and other service providers. Essentially, these combine both on-farm and off-farm generated data which either consumed or produced by the farmer. All this data needs to be centrally stored or aggregated to be meaningful. In a related study, Grameen Foundation conducted a landscape assessment on the use of big data to support smallholder farmers, the starting point was the use of farmer profiles. Through these profiles and with relevant Apps farmers access crop modeling data, rainfall data and soil information amongst many other data services. What about farmers rights to data? Farmers should have the right to own, control and monetize their own data, in cases were their data is consumed by third parties, they should be able to participate in the decision-making processes. Prior informed consent for the use of their data and benefits emanating from the sharing of data should be explained. Regarding policy issues, participants of that consultation alluded to the value of openness and that open policies should safeguard farmers’ rights and also encourage appropriate exploitation of the gathered data. Aligning needs with solutions: Data-driven agricultural innovation for Vietnam’s farmers .